AN otherwise quiet Sunday in a high-rise apartment in Kadri reverberates with the sweet sound of violins. MANGALURU: AN otherwise quiet Sunday in a high-rise apartment in Kadri reverberates with the sweet sound of violins. Over two dozen violinists, young and old, squat on the matted floor and string the fundamentals of Carnatic music on the violin, not once or twice, but for a good 5-6 hours with small breaks for lunch and snacks. They are not the ones who are very new to the fiddle, at least not all. Some of them have been playing it since the past several years or even more than a decade. But what makes them come together once in a month since the last 10 months is the urge to get stronger in the basics as they believe it will help them go a long way in their musical journey. Instrumental behind this unique initiative called ‘Swara Laya’ is Vishwas, 24, a violinist, who has created a platform for visual artistes of the region ‘Beauty Wall Spot’. He says many violinists, despite playing the instrument for many years, are not able to give concerts. They fail to understand which is the rightpitch or Shruti. This is because, after a few years, they forget the fundamentals. If they are strong in the fundamentals, then they can never go wrong in their tunes and it also gives them confidence. Vishwas was inspired by his guru and well-known Chennai-based violinist Vittal Ramamurthy. 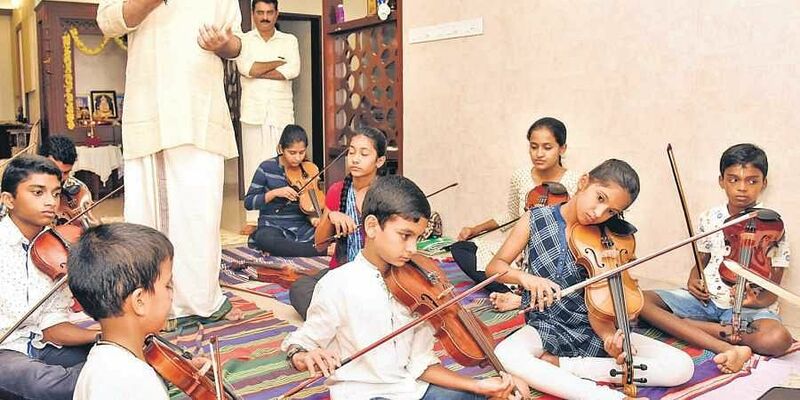 Since the last 19 years, he has been conducting ‘Karumbithil’, a free violin camp at Nidle near Dharmasthala in which violinists from across the country and even foreigners take part. Big artistes are invited to the camp to give concerts and from whom the budding ones can learn. A year ago, when Vishwas spoke to Ramamurthy about ‘Swara Laya’, he gave his blessings. Well-known sitarist Ustad Rafeeq Khan and many others encouraged him. During the day-long Swara Laya which takes place once in a month, the participants practise the fundamentals -- Sarala Varase, Janti Varase, Daatu Vasase in Lalgudi style and add a new varase every time. A noted musician is also invited to give a concert and a pep talk. In the last 10 months, vocalist Udupi Gopalakrishna, Abhishek Raghuram, Yathiraj Acharya, mrudangam artiste Ravi Kumar, sitarist Rafeeq Khan and others have interacted with the participants of Swara Laya. “Interaction with senior artistes will help us overcome the difficulties,” says Vishwas. Violinists from not only Mangaluru, but even from Kasaragod and Sringeri attend the monthly meetings. So far, 60 violinists have signed up for for Swara Laya which is ‘open for all’. Of these 60, at least 10-15 attend the monthly events without fail. A Sunday in a month which is convenient to all is chosen and they assemble in the house of one of the members. A spacious home which is close to the city but located in a calm area is chosen. So far, six violinists have hosted Swara Laya in their houses. The apartment of Prabhachandra Mayya, a music enthusiast, has hosted it many times. The expenditure of the one-day event runs into a few thousands but these enthusiasts do not mind it given their love for music. Venkatesh Bhat, father of Vishwas, is another person who is always ready to support such an initiative. Bhat says he loves to learn violin, but is not able to do it because of his age. Hence, he finds solace in helping others pursue the same. Sudarshan, who works with a private firm, is a regular participant of Swara Laya. He says that besides making his fundamentals strong, the practice also helps him destress. 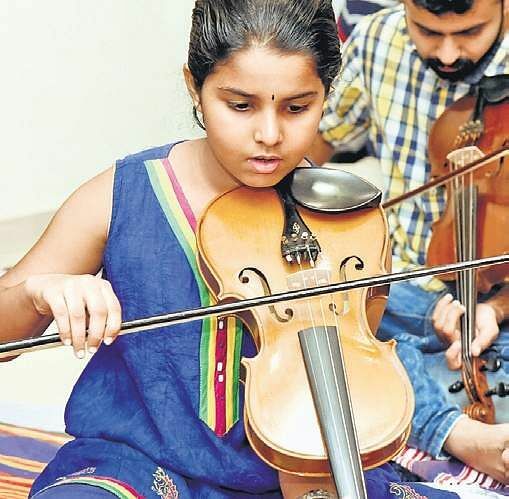 Swara Laya takes violinists back to the basics of Carnatic music so that they can become pitch-perfect. . A three-day event is planned for the first anniversary of Swara Laya from August 13 to 15.